This low carb taco salad recipe is healthy, easy to make, and it’s ready in less than 30 minutes. It’s loaded with delicious southwest flavors! This low-carb beef taco salad recipe really hit the spot for me. It’s been ages since I’ve had a taco salad with ground beef. And guess what? I didn’t even miss the tortilla chips. There’s plenty of flavor and crunch in here without it. The taco salad dressing is simply sour cream, the adobo sauce that comes in a can of chipotle chilis, and some fresh lime juice. It tastes amazing with the other ingredients! I left out the tortilla chips – this saves carbs and calories. I think you’ll love this smoky chipotle taco salad recipe. I love how fast it comes together, and we’ve only got healthy real-food ingredients in here. Definitely one of my favorite comfort foods. How do you make taco salad low-carb? You don’t really have to make too many changes to make a taco salad low-carb. I omitted the tortilla chips that are sometimes included in taco salad recipes. I actually don’t miss them at all, and I find that the onions and lettuce give it enough crunch. I also left out beans, which you sometimes see in taco salad recipes. I used a few spices to make my own homemade taco seasoning for this salad, but if you’re in a rush or don’t have the individual spices, you can use taco seasoning instead. You may also like my low-carb taco bowls. 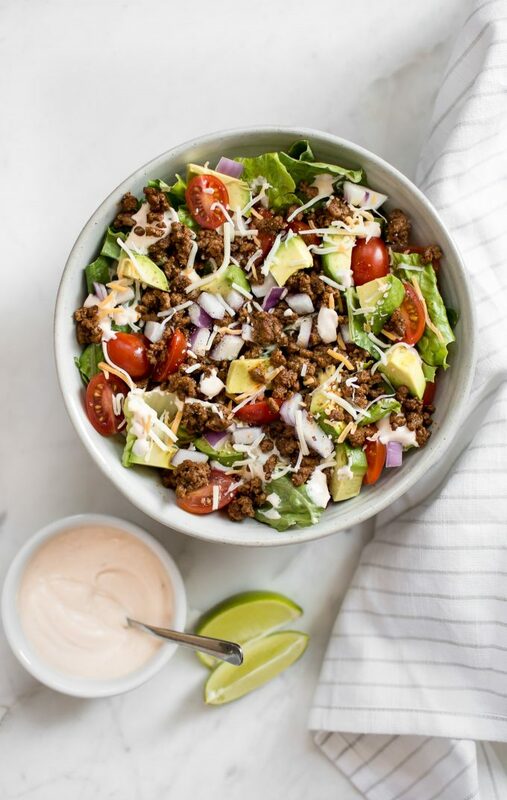 Hope you love this low-carb ground beef taco salad recipe! This low-carb taco salad recipe is healthy, easy to make, and it's ready in less than 30 minutes. It's packed with delicious southwest flavors! 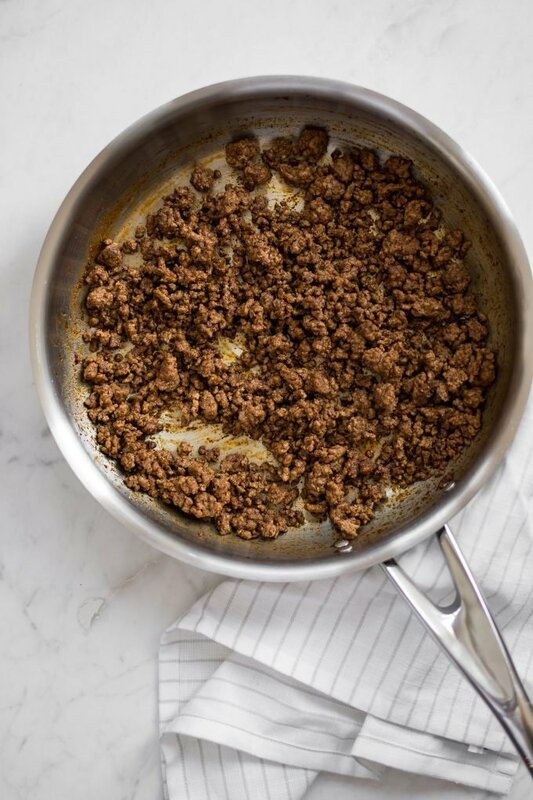 Add the olive oil, beef, and spices to a skillet over medium-high heat. Cook, using a spoon to break the meat up into smaller pieces (and stir often), for around 7 minutes or until it's cooked through. Meanwhile, prep your other salad ingredients and add them to a large salad bowl. Add the dressing ingredients to a small bowl and whisk them together. Once the ground beef is cooked, sprinkle it over the salad. Add dressing and toss. Serve immediately. Adobo sauce is the sauce that's in those little cans of chipotle chilis with adobo sauce (find these in the Mexican aisle at the grocery store). The dressing was semi-spicy when I used 1 tbsp of the sauce. It gives the dressing a wonderful smoky flavor. Add more if you want it hotter. Chop up a pepper or two if you want it really spicy! If you don't want to use the individual spices like I did, you can use pre-made taco seasoning if you prefer. You may also like my low-carb taco zucchini boats, my beef taco soup, or to browse my other low-carb recipes. I LOVE taco salads and this looks amazing! I think besides Caesar salads, taco salads are my favorite! This looks fabulous! My favorite kind of salad! I grew up with 8 siblings, so my mom made us taco salad all the time. Absolutely love this version!